Because seriously I will know if so much as a single cup is removed! And just because I’m feeling super-nerdy, that was NOT an LotR reference. My guess is that Tolkein was undoubtedly foreshadowing Oakenshield’s death by referencing the act that led to Beowulf’s death in the Old English epic of the same name, which predates The Hobbit by roughly 1000 years. Nerd cred! While the comic Fox would naturally be the one who couldn’t understand why Dragon wouldn’t buy chicken and waffles if Dragon had the capital to do so, the real life Fox and I share similar views on cash: it is a thing you acquire. It is not a thing that you dispense of without great forethought. The majority of people don’t sit down and puzzle out their opinions on how to establish wealth once they finish high school (although I imagine that the few people who do this manage to succeed in acquiring wealth). Rather, we inherit our attitudes about money from our parents. If our parents live on credit, we’re more likely to function under the assumption that borrowing is the best way to get what we want, and that we deserve to get what we want, and we deserve to get it right away. If our parents teach us to spend what we have when we get it, we’re not likely to think about future finances or consider why saving is a good option. If our parents exhibit extreme frugality, we learn to be suspicious of conspicuous consumption and to stack rather than spend. I started working when I was 11; my parents almost never gave me cash, so when I did buy frivolous stuff, it was always balanced by the knowledge of how much time it had taken me to earn that stuff. My own parents didn’t make large purchases lightly or buy useless things, ever. Their tastes were never influenced by fashion or indeed the possibility of upgrading. My dad bought an Apple IIe in 1980 and I’m pretty sure he was still using that machine when I graduated high school more than a decade later. He still has the same stereo–the same speakers–in the same entertainment center–he acquired in 1987. Admittedly, there’s a part of me that really really REALLY wants to upgrade my 4-year-old MacBook Air, but I can’t justify it. This one works fine; I don’t really have any income. Even though I could easily finance a $1,099 computer out of my savings, or with my excellent credit, rationally it’s a terrible decision, and I would never make it, even though I really really REALLY want a new computer. (The new ones have better batteries! And yes, I recognize that I could have a non-Mac laptop for 1/3 the cost, but then we’re in an entirely different discussion about money and possessions and why we make certain decisions.) Because there are just better things to do with $1,099, including leaving it in the bank, and I don’t have an immediate plan for raising another $1,099. Ergo, buying a computer is short-sighted. If I had a hoard, my attitude wouldn’t change. I’d fix the house, pay off the mortgage, travel more, and yes, get a 2015 Air. But I would probably still buy my clothes at Target and drive my mom’s old Honda. It’s just a matter of figuring out what’s important to you. 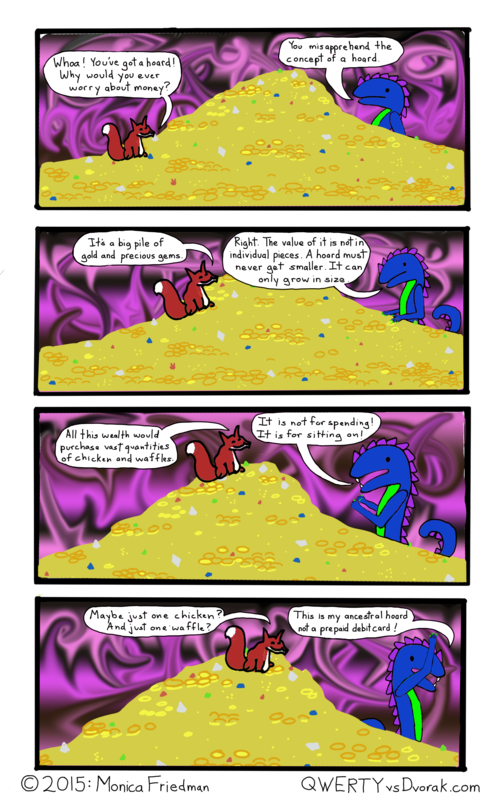 This entry was posted in dragon comics and tagged dragon, economy, fox, frugality, gold, hoard, money on May 6, 2015 by littledragonblue. What about half of a chicken? And half of a waffle?